Busy times the past two days. Mom is visiting and there have been all sorts of things to do. 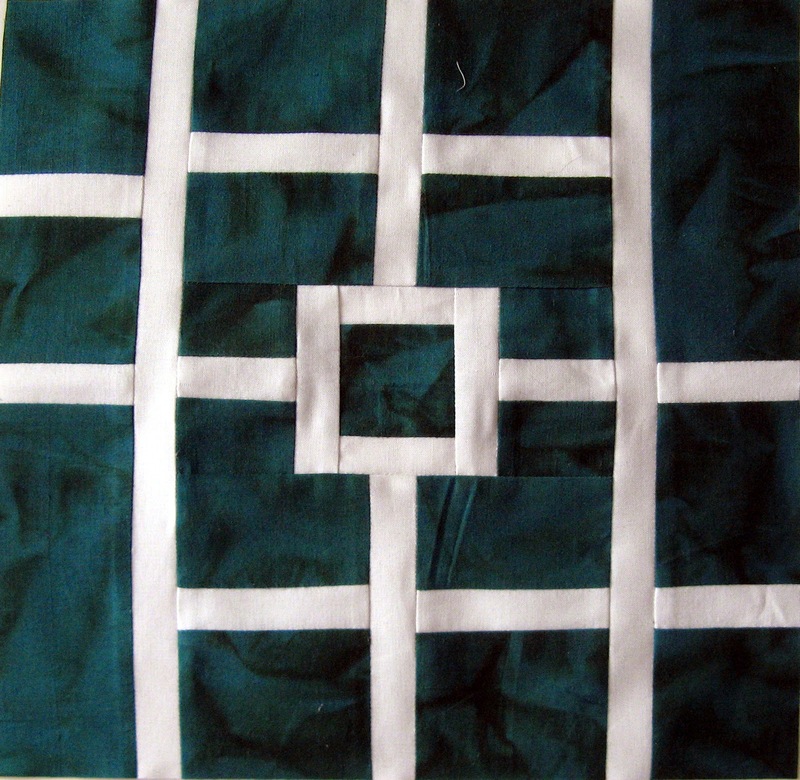 I presented the Quilt Carry Bag workshop today at Paradise Sewing. 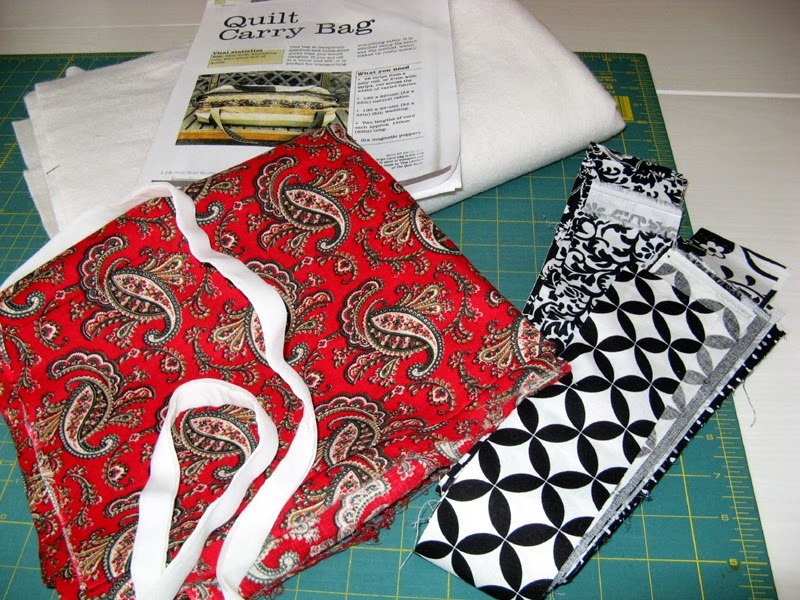 Three new quilters have lovely bags of their very own to carry their cherished possessions! No change to my stash numbers to record today. I stayed away from fabric purchases so yippee for me! I did not have time to calculate fabric used on the Quilt Carry Bag I made from my stash; I will deduct it next Sunday. Kerry will be able to deduct a bit as well since I made a second bag for her with stash from her sewing room. I will be busy with Mom the next few days. 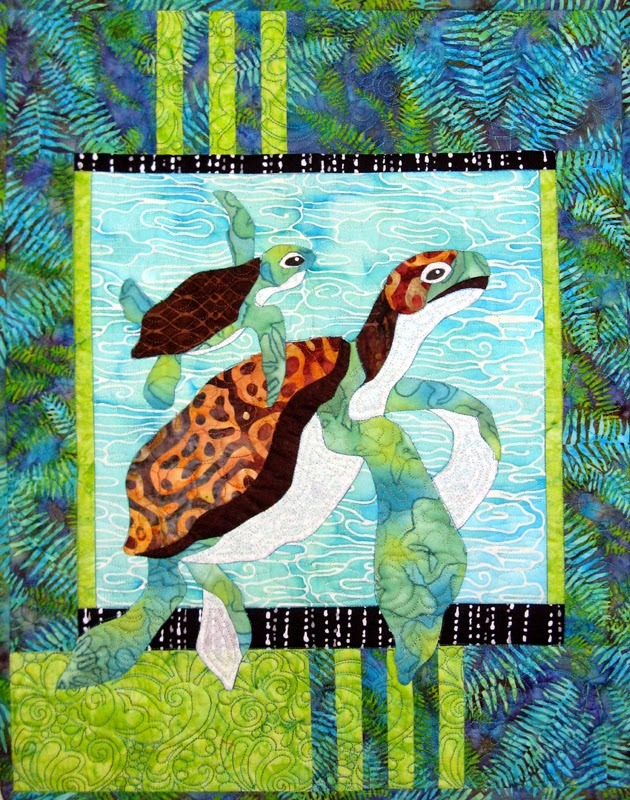 A quilting retreat starts Thursday! Lot's of fun in store ahead. I hope that your week is full of sewing or whatever pleases you. I have been busy lately mostly with hand sewing. 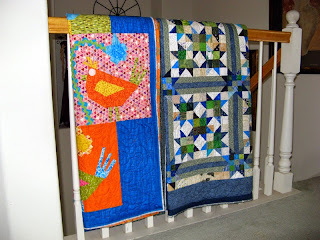 Kerry's Quilting has me busy and I'm loving every bit of it. I now have all the rick rack that is the flower stems of Krazy Kookoos done. Each one of those stems took nearly an hour to sew down...of course some of that time was intermittently interrupted by KoKo. When he wants attention there is no sewing! He has to sit right on the spot I'm trying to sew. Oh but I love my fur baby =^.^=. Eyes on Krazy Kookoos still need to be sewn on. I'll have a bunch of green eyed kookoos soon! Kool Krystals sits ready for hand sewing too. 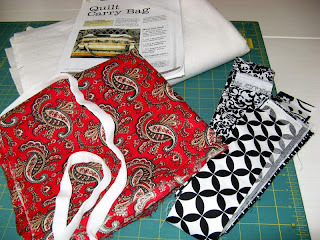 The sewing that I have been doing has been on Quilt Carry Bags. 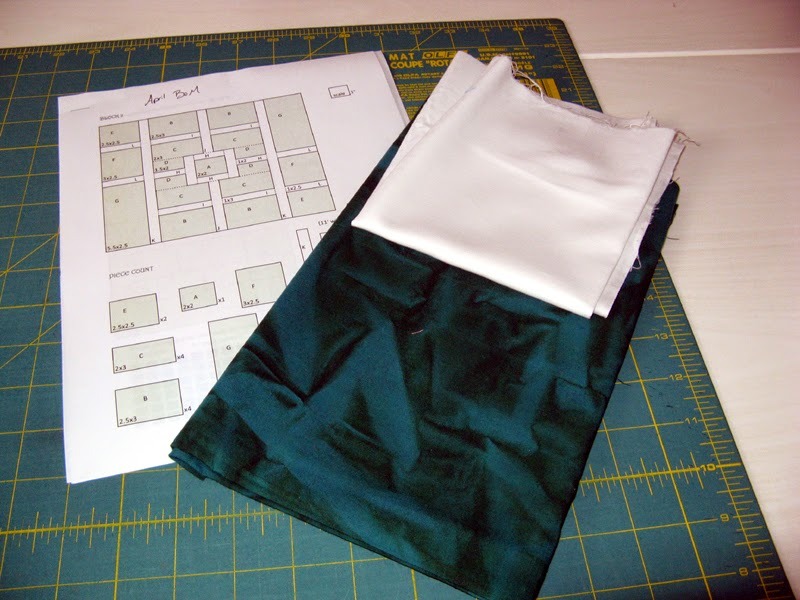 I'm brushing up on the instructions as I will be giving a workshop at Paradise Sewing next Sunday, May 31st to make it. Mom will be in town then at helping me. If you are in the area and interested in having one for your own call them and join us. I hope that you are enjoying your Memorial Day and remembering the many who made it possible. Enjoy your week ahead. I'm hoping mine goes by swiftly because Mom is coming to visit arriving Friday. I haven't seen her since September although we talk nearly every day; it is not the same as being with her. A little late with this post, but one that is important to keep me accountable! DH dropped me by Beverly's in Clairmont for that dark piece that is blue for the binding of Kool Krystals. This project by Bonnie Hunter called Scrap Crystals was made in a workshop with her late last year. I just picked it up from Kerry's Quilting on Friday. 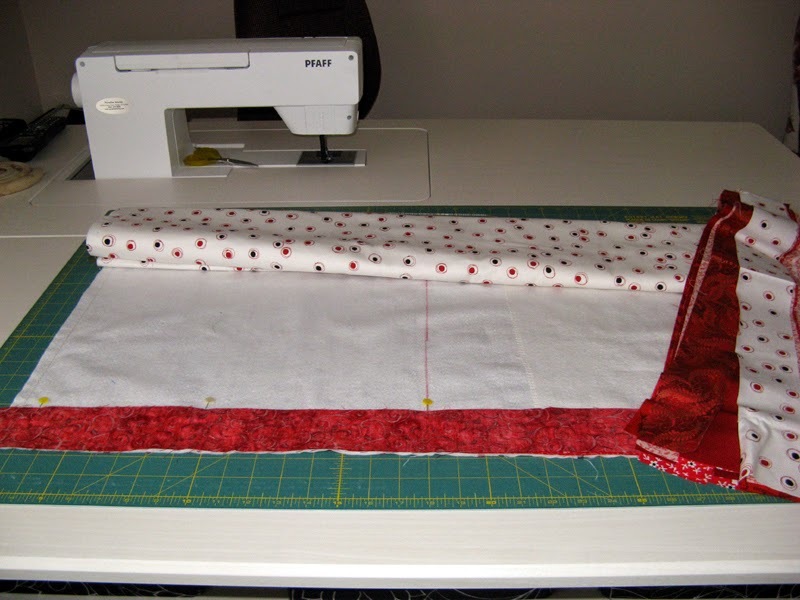 The binding has already been prepared and machine sewn in place. 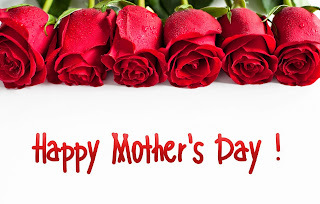 More time to sit in front of the television with DH and very soon Mom! The other three pieces are all FQs that will soon go into my Komatose project. Komatose is Bonnie Hunter's Lazy Sunday. So this week there is another enhancement. Overall though I'm doing very well using my stash. 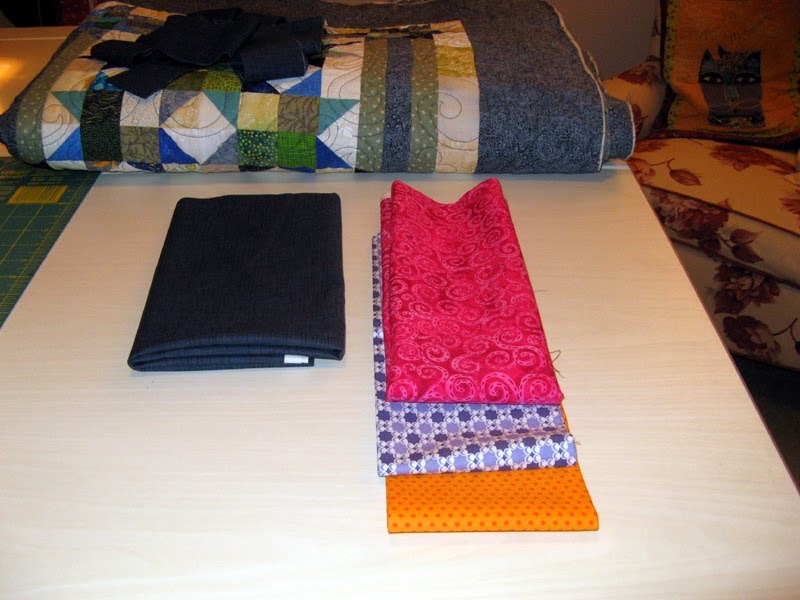 I'll be counting a couple of Quilt Carry Bags soon. Nothing this week on my Design Wall. All my work has been on my lap. I'm in the process of sewing down the rick rack on Krazy Kookoos. (Design by Buggy Barn called Bird Brain.) I have many of them done now. It is an easy process just a lot of turning the project around to get the best angle for the hand sewing. Once the rick rack is secure the button eyes come next. 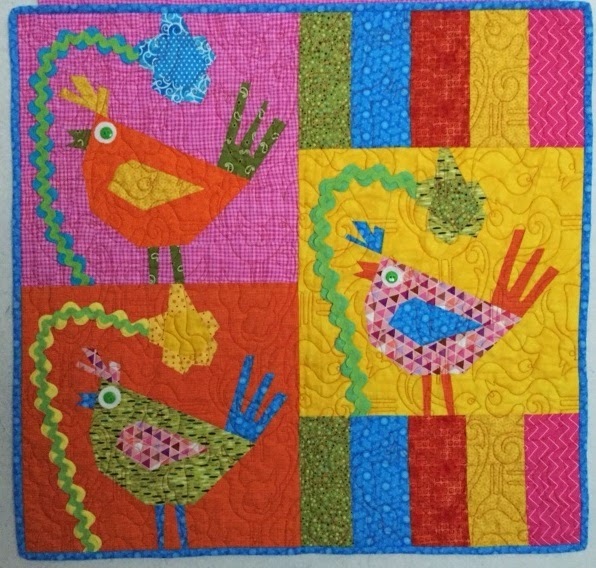 Catch other projects through the links at Patchwork Times. This is not up on my design wall, but what I'm working on this week. 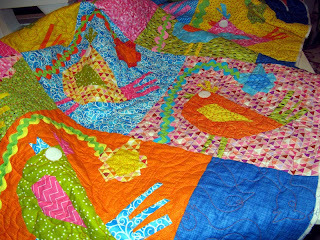 I will be guiding a workshop on Sunday, May 31st at Paradise Sewing in Poway, CA to make this Quilt Carry Bag. My Mom will be in town and she'll be helping out too. 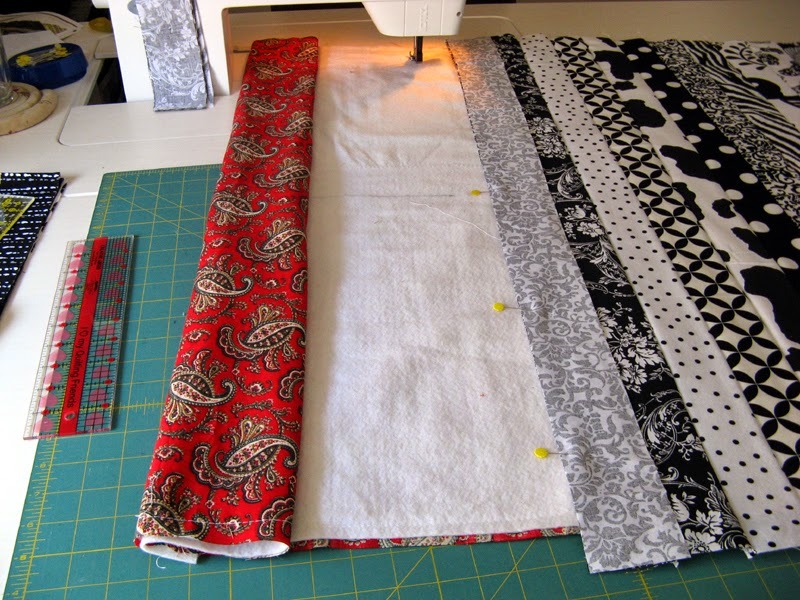 It is very simple and can be made from scraps you probably have on hand. The main part of the bag uses 2 1/2" strips. I will need to purchase some twill tape for the handles, but this project is nearly complete. 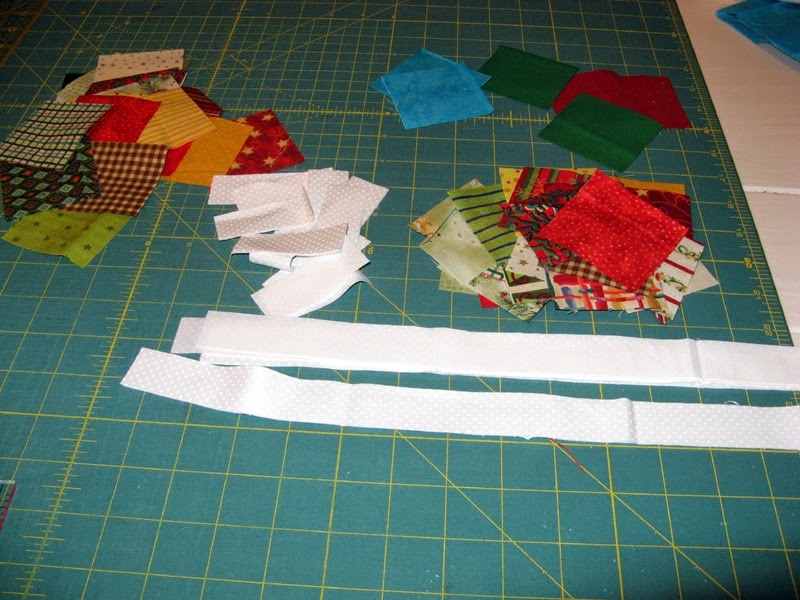 This photo shows sewing the strips across the lining/batting. 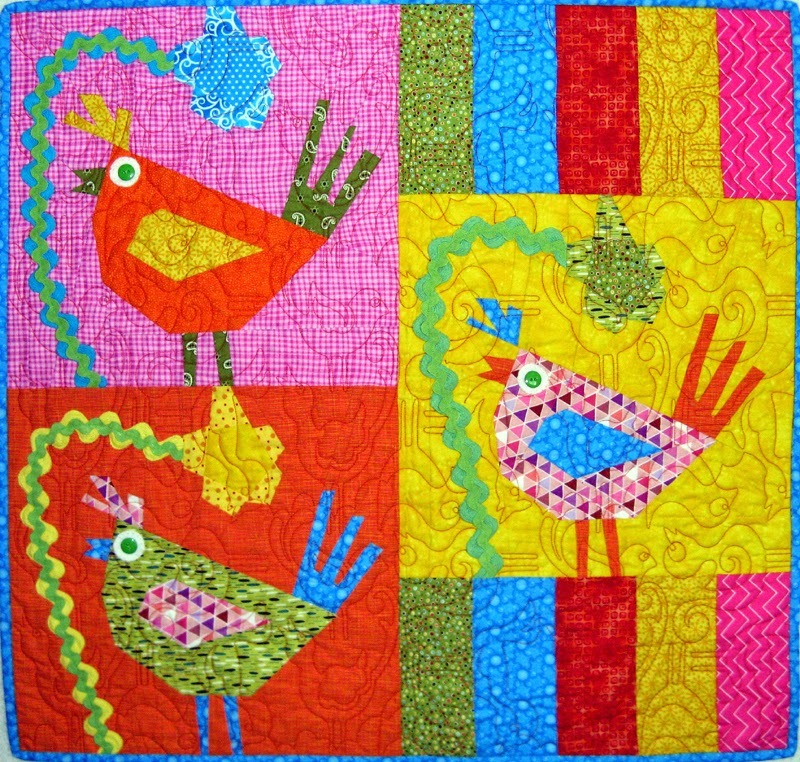 Yes, a quilt as you go project. Rolling up the unsewn part so that it flows well while the strips are being sewn in place. This is the bag finished less the handles. If you are in the area and interested in attending the 4 hour workshop to make one for yourself give Paradise Sewing a call. 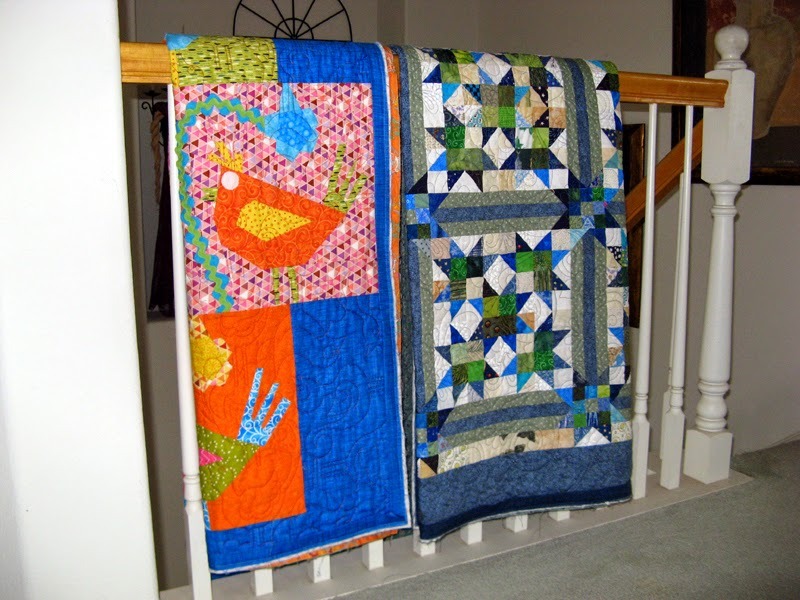 Sunshine Quilt Guild Monthly Meeting is Tuesday night. I have lots to share. 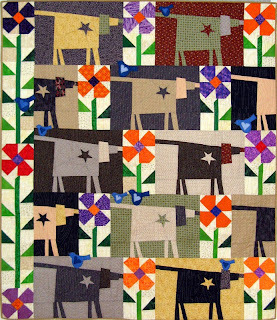 I'll also be dropping off a quilt for the Chula Vista Quilters' Guild Annual Quilt Show that takes place this weekend. Hope that you have a wonderful week. Mine is going to be a busy one! I made two of these this week. It's tiny finishing at 16" x 16". The first one finished was my May UFO. 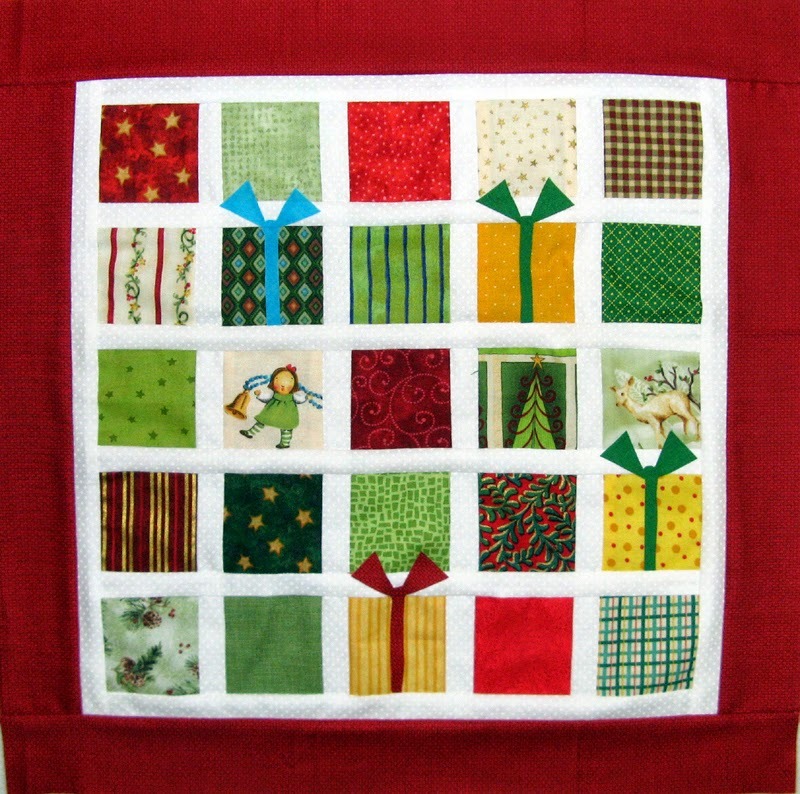 I liked it so much and the 2 1/2" squares are so readily available that a second one was made. It will make a good gift. 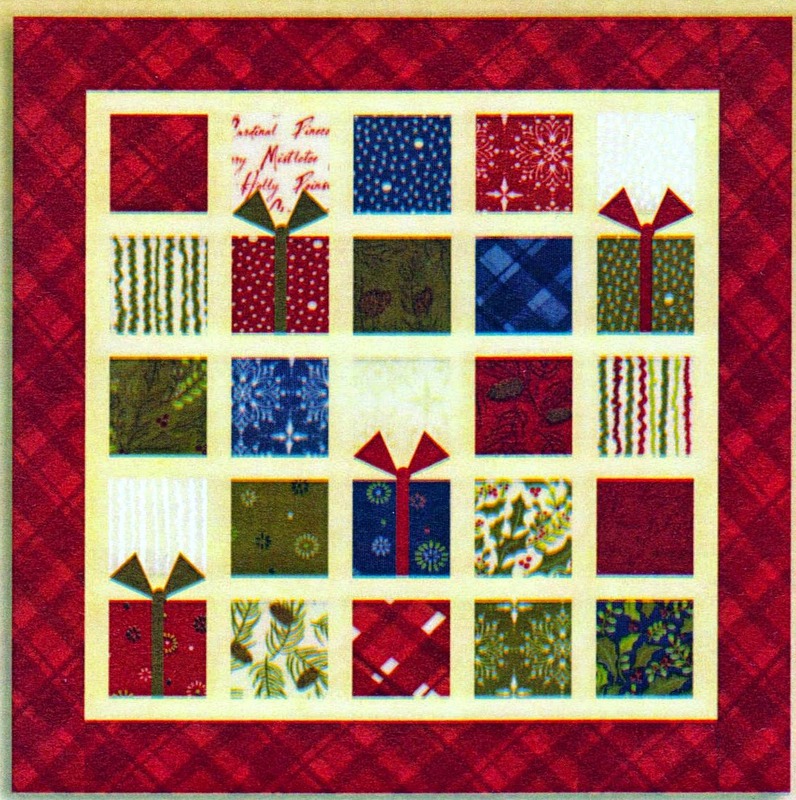 The pattern is called Tiny Treasures #582 by Sandy Gervais. 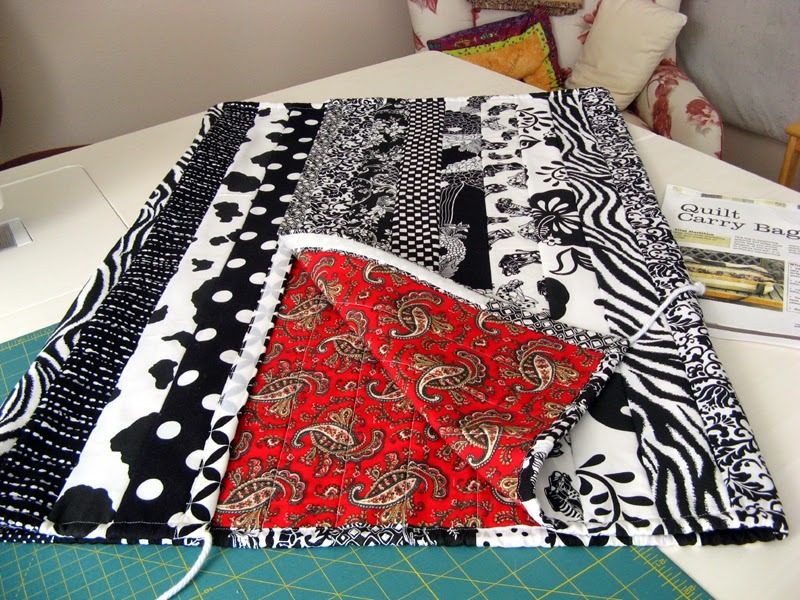 I have a new binding project to work on this week. 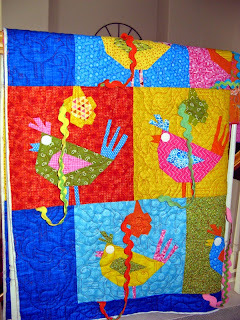 The full size Krazy Kookoos is ready for rick rack (flower stems) to be sewn into place, green buttons added to the whites of the birds eyes, and of course the binding/sleeve/label to be put down. The rick rack portion will take the longest. There are 17 blocks of flower stems and eyes to secure. The rick rack goes up and arcs around in front of the bird. So that you can get an idea of that placement I'll share Krazy Kookoos 2 which finished first. It is so cute! 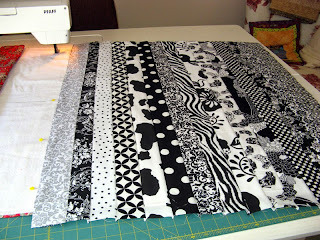 Yardage for the two Tiny Treasures projects is claimed today and no purchases! A good stash busting week... If you have time go back a few blog posts of mine to see projects just finished this week. Enjoy your week. I have another finish to share today. Binding done, label on, sleeve down. 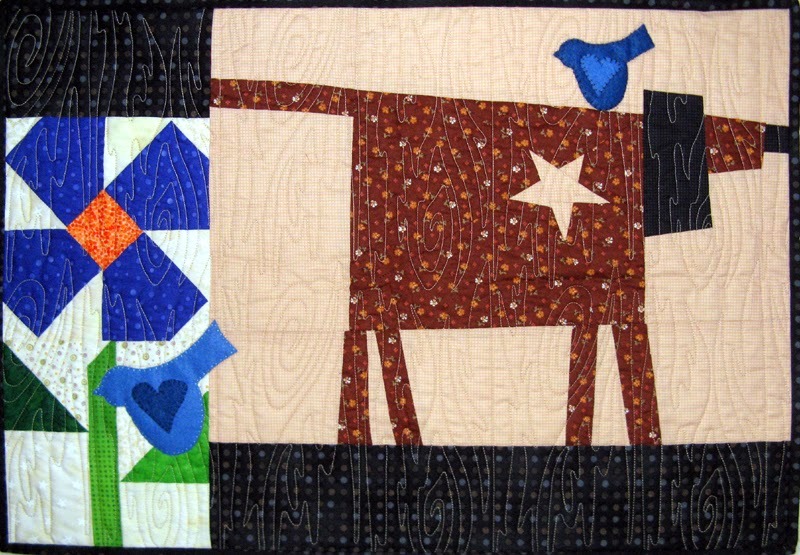 This is the full project of Crazy as a Bird Dog by Buggy Barn. Earlier this week I shared my finish with the mini Krazy Koons 2 that was made with the leftover block. I'm loving these bird dogs! Next up to finish is the full project of Bird Brain. We had a wonderful rain early morning. It came down pretty steady for about three hours and then a little bit a few hours later. The sun is trying hard to come out now. I'm headed out for some shopping today. Want to find something fun for my next weekend's activities. TGIF twice fold since it is my Off Friday! Finished the binding on this cute project last night. These are the left over blocks from Buggy Barn's Bird Brain design. I added the piano keys at the top and bottom of the yellow block to bring it to the square. 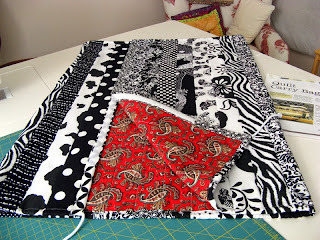 I started working on the last of my binding projects which is the full size Krazy Koons. 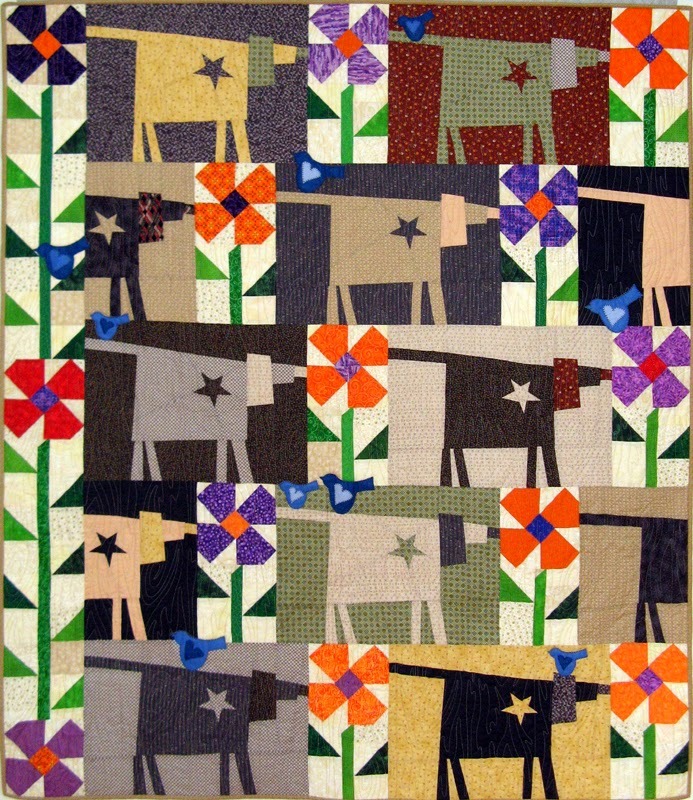 There is still one more Buggy Barn quilt with Kerry's Quilting. If all works according to plan the full size Krazy Kookoos might be in my hands on Tuesday. My May UFO is done already. This is a small, easy design that comes together fast. It finishes at 16" x 16". The more complicated part of it is making the bows. These are fused down. The project will probably never see a washer or dryer so little concern about the bows coming up. I just might quilt this one myself. More information on the pattern can be found on my 2015 UFOs page. Kringle's Kargo is #12. I have the April BOM done now. Sure had a lot of pieces, and there was a quite a bit of trimming to get it to the 11" unfinished size. I do like it. I haven't been too lucky to be a winner, but this one might be nice to have my name drawn. I'm ready for the May meeting. I decided to make two of these at the same time. It is such a small project that doing so shouldn't be much effort. The finished project is 16" x 16". Doesn't that blue stand out? The fabric on the left that has the diamonds will be where the blue bow comes to play. Well, at least that's my current thought. Hope that you enjoy this first Monday of May. Are your flowers in bloom? 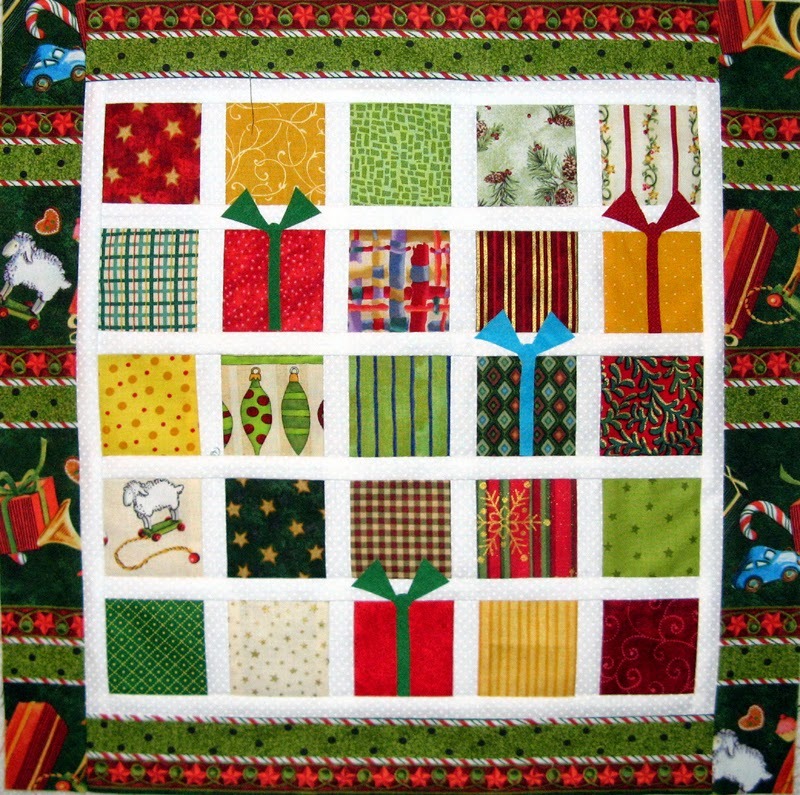 Check in to see more projects in the works at Patchwork Times. Let me start out with fabrics from my stash for the May UFO project I will be working on during the month. This is a little project which I'm excited about. The greens, reds, golds, and dark ivorys will become the "packages" with the blue, solid green, and solid red the bows. The "packages" start with just a 2 1/2" square. There are 25 of them with four getting a bow. 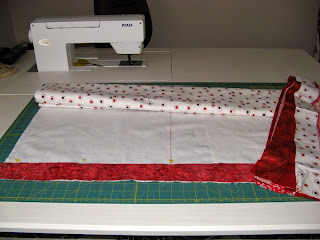 The white will be the sashing with the green print becoming the outside border the red print the back and the stripe the binding. Janet O. came up with a terrific name Kringle's Kargo. How cute is that? 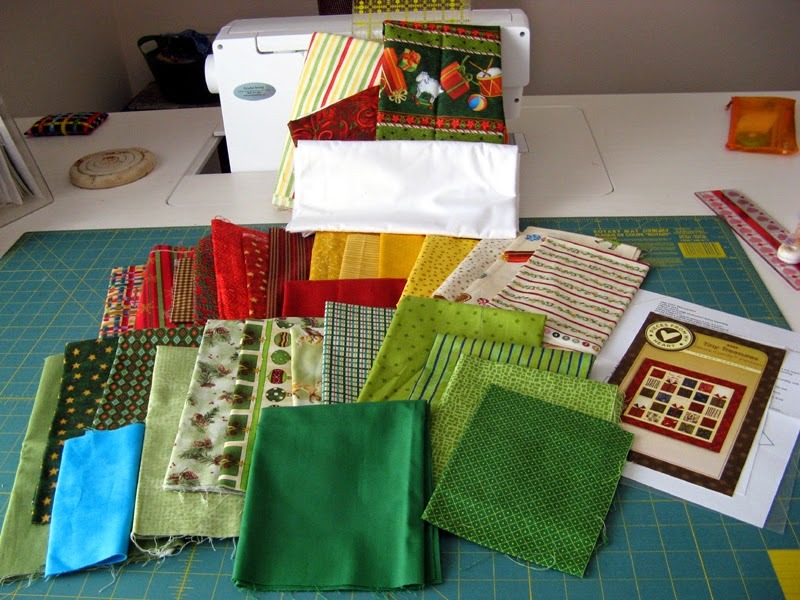 This next project is the Sunshine Quilt Guild April BOM. 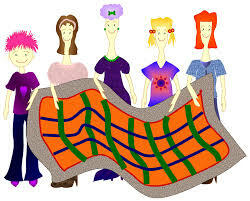 We are to use a "peacock" fabric color in the shaded areas of the diagram and white around them. There are two different block layouts. Mine is Block 2. There's a lot of pieces to this 10 1/2" finished block. I mentioned that I had lots of binding to do this past week. I still have two more to finish yet. Kooter Klan is a design by Karen Karen Brow called Newly Hatched. This is the smaller bonus pattern that comes with the pattern. 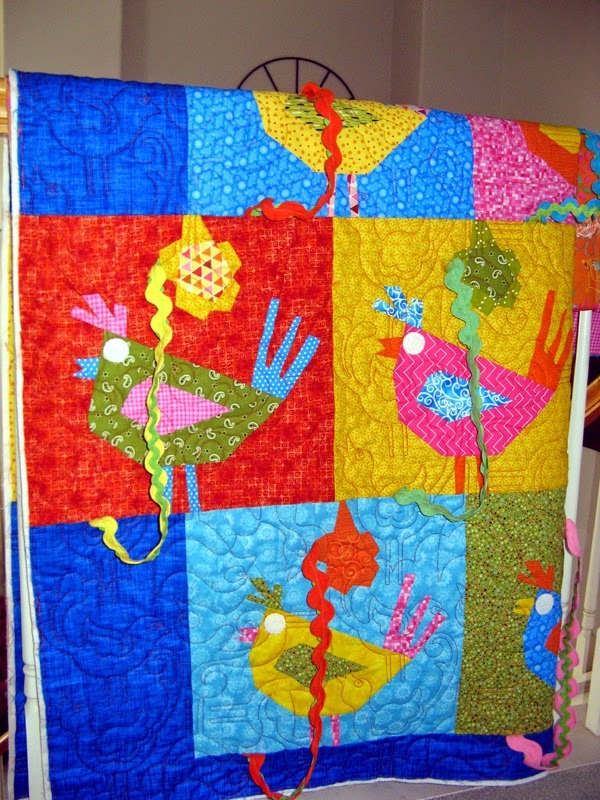 Kerry did a wonderful job with the quilting. Krazy Koons 2 is going to my Mom. Like I've done before the leftover blocks from the original pattern are set in some sort of fashion and assembled into small wall hangings. I did make another flower and two more birds to finish this project. 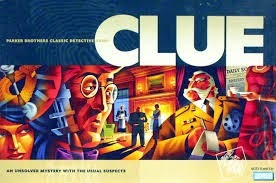 My Clue Challenge is done and ready for June's Sunshine Quilt Guild meeting. Let me say that it was very easy to put a name on my project! It had size requirements that had it finish as a small project. Lots of different fabrics, but not much by volume. You'll see it soon enough. Today I'm counting the yardage. 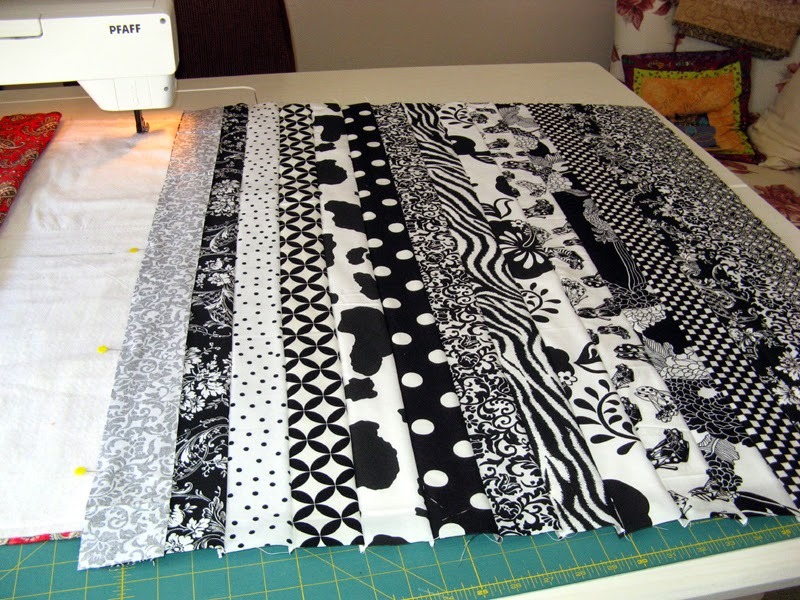 Now let me get busy again in the sewing room putting my UFO together. Hope that you enjoy your week ahead. Mine was the first in the parade this month. I managed to have Kurosity done during the first week. This gave me time to work on Kamikaze the rest of the month. Kamikaze is also a UFO that has yet to be selected so I'll be ahead when it is. For this month Marti has selected #12. 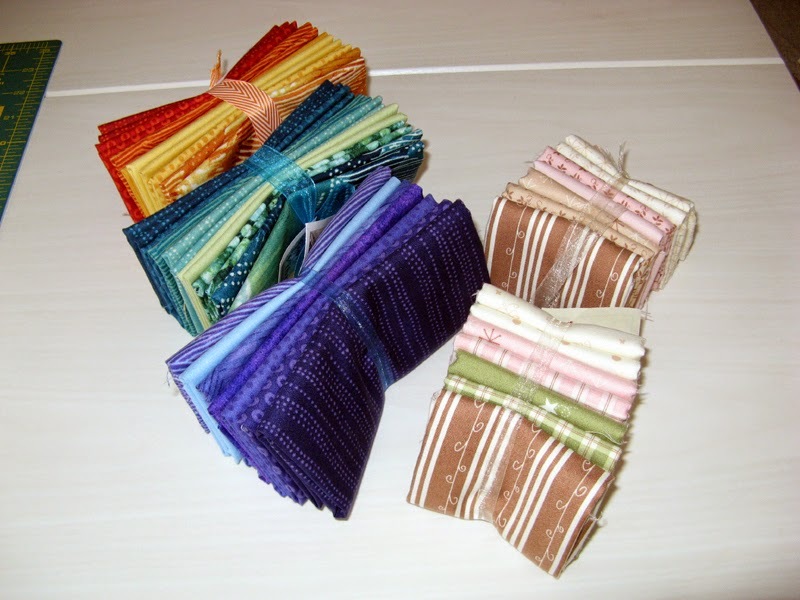 For me that is the project shown below called Tiny Treasures. It is a Moda Candy Pattern #582 designed by Sandy Gervais. This pattern is tiny which makes me happy as this is a busy month. 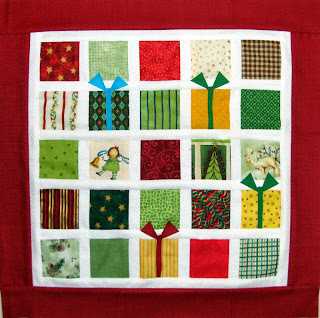 I'll be working on pulling my Christmas fabrics for this one over the weekend. Should be able to get it all from my stash. Don't you love the way the bows jump up? Now I could use some help on a "K" name; any clever thoughts out there? TGIF!